Going to a party and need to wear something that just stops the party cold. A zoot suit is your best bet to make that happen. There is just something about these long jacket style suits that makes people stop and stare like nothing else. 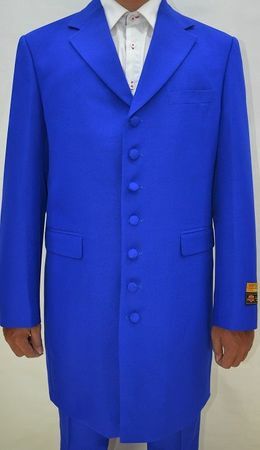 This royal blue color zoot suit is features a 36 inch long 7 button jacket that features the matching vest and baggy pleated style pants that will make your entire zoot suit look really make waves. Fabric is Poly/Rayon that is easy to wear.